My favorite books to read are mystery books. So I guess that’s part of why I love mystery quilts. 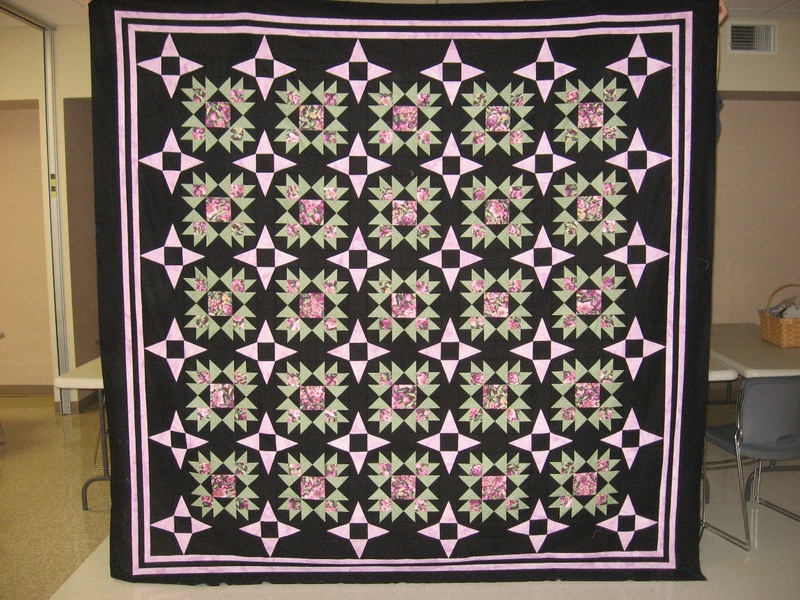 I started out doing mystery quilts on the internet. I found different sites that offered them and I would follow along each week, doing the steps as they were posted. I had fun! I was always anxious to get the next clue. One of my favorites was a tessalations pattern. 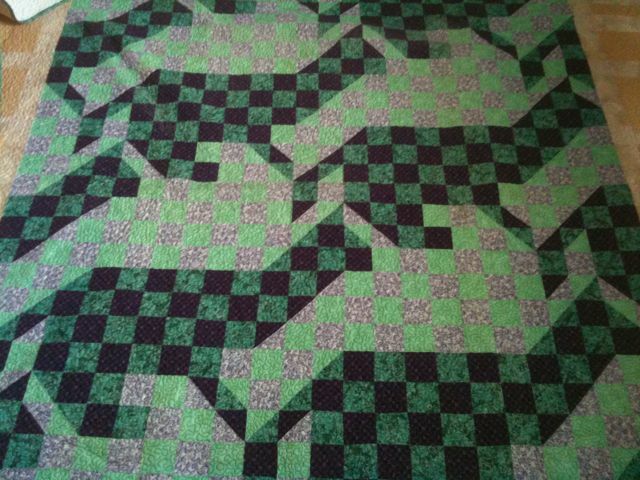 I could not, I repeat “could not” figure out what the quilt was going to look like, even after I had all the blocks made. Anyway, it ended up being cats. Of course I’ve never seen green and purple cats, but oh well!! Someday I would like to make it in black and whites. Wouldn’t that look good? This one is Linda Ballards Fractured Crystals. 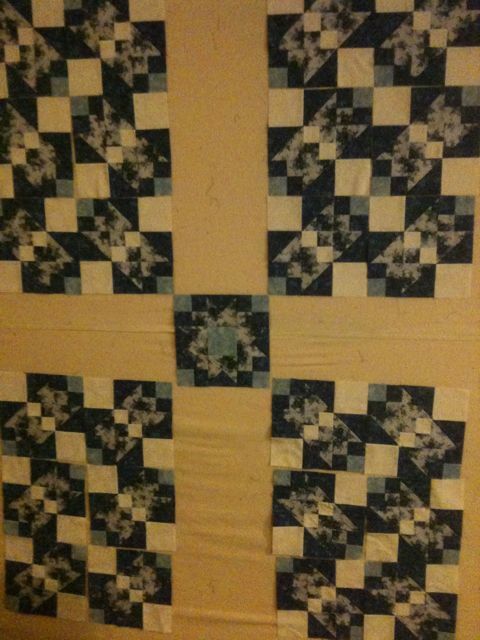 I still have 10 blocks to sew together. I had a hard time trying to figure out the pieces. I finally did. Whew! I only have a few small pieces of the dark fabric, so I was getting nervous that maybe I didn’t have everything cut out, but I finally figured out that I do have all the pieces. Anyway, that’s what I’m working on for now. I haven’t written on my blog in ages, but I hope to stay more up to date on it. Oh, and here is this years mystery lock in quilt. We call it Starry Illusions. Sharon and I got lots of compliments on this one, everyone seemed to like it. Hi, i´m a quilter from guadalajara mexico, i love your quilts, are really beautiful, i see a quilt called mystical twist in this blog: ” TERESA’S QUILT STASH”, and when i asked about patterns, she send me to this side. The patterns is available for sale? i can get a copy? The pattern for Mystical Twist is only available at Quilters Quarters Quilt Shop. http://www.quiltersqtrs.com You’ll probably need to e-mail them and ask for it, as I don’t think it’s listed in the patterns. But it is there. I wonder why my reply showed up as anonymous?